This consolidated effort, the company terms "Team South Africa", and is integral to the success of the firm's most recent multi-billion Project Hotel. The recently awarded multi-billion Rand contract to build a Hydrographic Survey Vessel (HSV) for the South African Navy represents one of the most complex projects to be undertaken in the African continent in recent years. The vessel will replace the Navy's SAS Protea, which has been in service for 45 years. Southern African Shipyards was judged the worthy winner of the world-class and sought-after tender, which will further establish the company as a shipbuilder of note. welcome boost to the local economy. 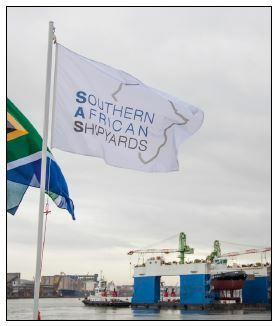 The Shipyard, in its role of "Prime Contractor or a Primary Systems Integrator" partnered on a turnkey risk sharing basis with a number of South African and international companies who are specialist in the areas that make up the complex systems and sub-systems that constitutes an HSV. Bringing together a team of specialist experts in their respective fields managed to convert a complex project into very manageable task. It's this approach that resulted in the completion of the project to deliver nine tugs to Transnet National Ports Authorities. Not only did this project result in the achievement of an R800 million Supplier Development Programme but previously won the KZN Top Business Partnership Award. The milestone TNPA contract is the largest single contract that the parastatal has ever awarded to a South African company for the building of harbour craft. Durban-based Southern African Shipyards previously built 12 other tugs for TNPA, but the recent contract was for a brand-new generation fleet, which meets international standards and boasts the latest technology. The 31-long-metre vessels are among the world's largest and most powerful harbour tugs and are destined for the various South African ports where they will be able to efficiently manoeuvre and safely pull the bigger ships that are now entering South African waters. The projects reinforces the capacity and skill of South Africa when it comes to competing in the global shipbuilding industry, TNPA has said. This has truly been an exercise in masterful planning from start to finish. It is also visible evidence of the government's Operation Phakisa (leveraging off the oceans economy) in action. the wellbeing of future generations. Another aspect has been training maritime personnel through a grassroots development Marine Incubator Programme. A partnership has been nurtured with the eThekwini Maritime Cluster (EMC) to provide employment for graduates through the organisational spheres and expose them to all aspects of operating a maritime focused company with international reach in a South African context. Furthermore, each tug involves at least 60 percent of locally manufactured components, while Southern African Shipyards partnered with reputed international companies for aspects that cannot be manufactured in the country, like the propellers and engines. Southern African Shipyards' partners, TNPA, have been actively involved in the manufacture of the tugs too, sharing in the production process, attending production meetings, quality assurance programmes, being part of the inspections, and the actual fabrication as well as being part of the acceptance commissioning trials. 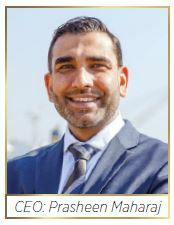 "We believe that Southern African Shipyards and TNPA have forged a unique and long-lasting working relationship worthy of recognition," says CEO Prasheen Maharaj. He added, "Southern African Shipyards plans going forward are exciting and are destined to set the company on a bright new course." The company has a Middle-Eastern client and now and then, he sends his superyacht to the shipyard for an upgrade. 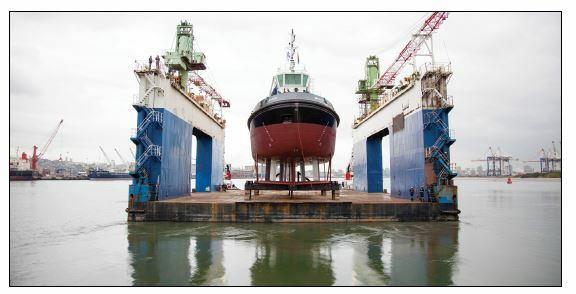 Southern African Shipyards are also currently building a barge and are due to have a ship into the dry dock for repair.